Yep, with all those sunny photos of Daleks taken during the filming of this story, someone decided to use one of a dummy Dalek missing half its appendages and obscured by smoke! Really eyecatching. So there was general dislike of the official covers at the time. 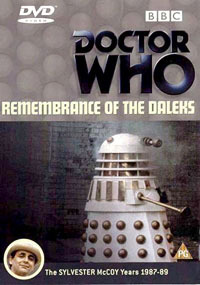 The big block of grey roundels was a variation on the then BBC house style but was widely criticised for taking up half the cover, and even when the picture area changed from a single poor-quality shot to an amateurly produced photo-montage it was little improvement and fans began producing their own alternatives. Perhaps the most well known of these, and certainly often the best, were those by Rob White at Chameleon Circuit (he used to work for me, you know). I wanted to do something very different to the official covers and many of the other fan designs, which also tend to be montages held together by a uniform colour wash. As well as giving the illustration more space, I do them in full colour and use the appropriate logos (painstakingly recreated in higher quality than a screengrab would give). I also focus on picturing the monsters/villains of the story, with the Doctor prominently positioned, not relegated to a small circle at the bottom. As well as the front cover illustrations, I write all the text on the backs myself, including giving each story a movie poster-style tagline. To see the full collection so far, go to Velvet Jacket, where you can also download high-resolution (200dpi) copies for printing should you wish to give your Who DVD collection a new look. With the current increase in Doctor Who DVDs to one a month (and often a single release is actually a boxset of two or three separate stories) I’m working on my covers more often in order to get them ready in time for release. So I thought I’d have a go at keeping a blog of my progress, but also to provide some comment on the official covers, other fan designs that catch my eye, and maybe discuss the Photoshop techniques I use. I hope you’ll add your comments too, not just on my covers, but also general design ideas and tips that pertain to the Who DVDs. I work as a production journalist/graphic designer in business magazine publishing, which I love because it’s all about presenting information in a clear and concise way that readers will be able to take in quickly and accurately. It doesn’t involve doing as much in Photoshop as I’d like (it’s my favourite application), however, so I started producing alternative Doctor Who DVD covers as an excuse to use and develop my Photoshop skills. I had some flattering feedback from people who saw them, so thought I’d stick them up on the web for anyone who’d like to see/use them. I do them primarily for my own collection (it’s so nice working to my own brief, not someone else’s, for a change), but I’m always open to comments, suggestions and questions, which is partly why I’m trying out this blog. And why Doctor Who covers? Well, obviously I’m a fan and have built up a wide selection of photographic material that I can use, which wouldn’t apply to other subject matter. But also largely because its much more fun designing something you know about and enjoy, especially if you’re doing it for pleasure as I am. It inspires me to make the end product as good as I can, and while I may not always be 100% happy with a cover – often because the quality of photos I have access to isn’t always great – I’ll be satisfied that I’ve put a full effort into it and determined to improve on the next one.